For renewable energy advocates, 2017 was a pretty good year. First, the Public Utilities and Energy commissions denied Southern California Edison’s proposed refurbishment of the Ellwood Power Station in Goleta and the construction of the Puente gas peaker plant in Oxnard. This decision is considered by the energy community as a watershed moment, marking the beginning of California’s transition from centralized energy to a distributed model based on renewable energy generation and storage located close to consumption. These decisions were accompanied by city council resolutions passed in Santa Barbara and Goleta to target a 100% renewable energy portfolio. Finally, SCE rebooted its suspended energy proceeding for Goleta, and expanded it to include the Moorpark Sub-Area encompassing South Santa Barbara and Western Ventura counties. 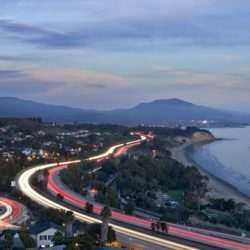 This Request for Proposals (RFP) proceeding, launched February 28th, seeks to develop between 76 and 95 megawatts (MW) of capacity, preferably in Santa Barbara County to help resolve its resiliency issues. From outward appearances, it seems that the wind is at our back and smooth sailing lies ahead. Unfortunately, the situation is far from simple, and the RFP exists both as an opportunity and a potential trap for local communities. In their RFP documentation , SCE has stated a “strong preference” for renewable distributed energy resources (DERs) and placed a premium on developing DERs in Santa Barbara County. The Academy, in collaboration with non-profit Clean Coalition, is surveying the Moorpark Sub-Area and has found an abundance of optimal locations to produce at least 76 MW on already developed commercial-industrial sites. To mobilize the community to develop these locations, the CleanEnergy805 coalition (of which the Academy is a partner) hosted two local workshops that were well attended by developers and site owners. For Santa Barbara County, SCE has reserved the right to accept proposals for gas-fired generation (GFG) resources, meaning that possibly one or more 25+-year natural gas power plants could be developed which would directly conflict with the municipal resolutions targeting 100% renewable energy. Although such plant(s) would likely be located outside city limits (somewhere between El Capitan and Gaviota), use of fossil-fuel GFG power would keep Goleta and Santa Barbara from meeting their obligation to develop a 100% renewable energy portfolio. Second, SCE’s traditional RFP process— which has historically contemplated approval of a few large generation projects— is not suited to distributed energy, which would require the development of a much higher number of sites to achieve the same result. To maximize stakeholder participation, fundamental restructuring of the procurement process is needed to streamline approvals and provide market certainty. Finally, the RFP requires that all proposals be submitted for review no later than June 21st, an extremely short timeline for the number and scope of projects needed to supply the requested amount of power on a distributed basis. Furthermore, unless projects meet certain “fast track” requirements, eligible sites must be approved for “interconnection” to the grid through an arcane and time-consuming process. In this RFP as currently configured, if you can’t “fast track,” don’t bother. Despite community efforts to assemble projects, if an insufficient amount of renewable energy is approved under the RFP, SCE will probably elect to include one or more GFG projects in the RFP. This would saddle the area with expensive, long-term facilities that will likely retire early and be paid for by ratepayers (i.e., you and me), regardless of how long they operate. Furthermore, this scenario effectively prevents the achievement of local 100% renewable energy goals until the plants are retired. SCE’s RFP should be seen only as a first opportunity along the path to distributed, renewable energy, and communities must ensure that it doesn’t adversely impact progress towards their 100% renewable goals. Remember, the utilities and regulators work for us, and community activism can go a long way to determine how the RFP is conducted and whether GFG resources are approved. Register on the RFP website, track and comment on its progress and let your elected officials know that they should be calling the shots on local energy development.